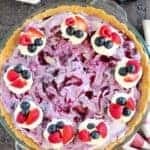 Ice Cream Pie with Graham Cracker Crust – A graham cracker crust filled with strawberry ice cream, swirls of blueberry sauce, and a topping of whipped cream and fresh berries. 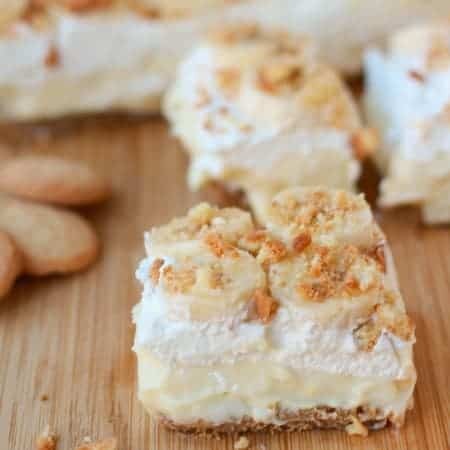 A combination of homemade and store bought ingredients makes this a fun and easy summer dessert. 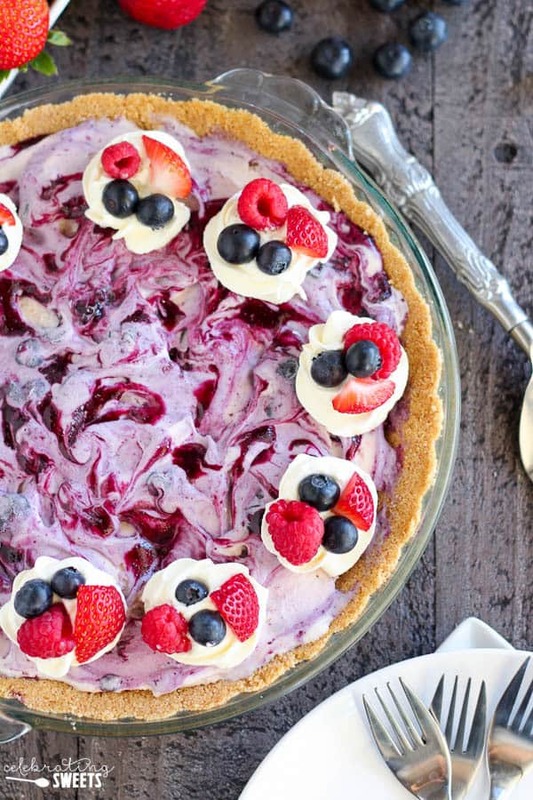 It’s Friday and I made Berry Ice Cream Pie! 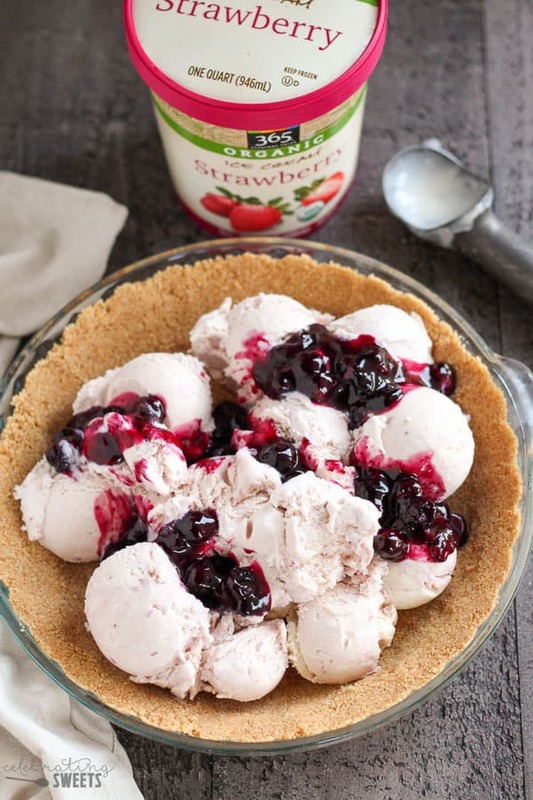 Graham cracker crust, strawberry ice cream, swirls of fresh blueberry sauce… don’t you like where this is headed? 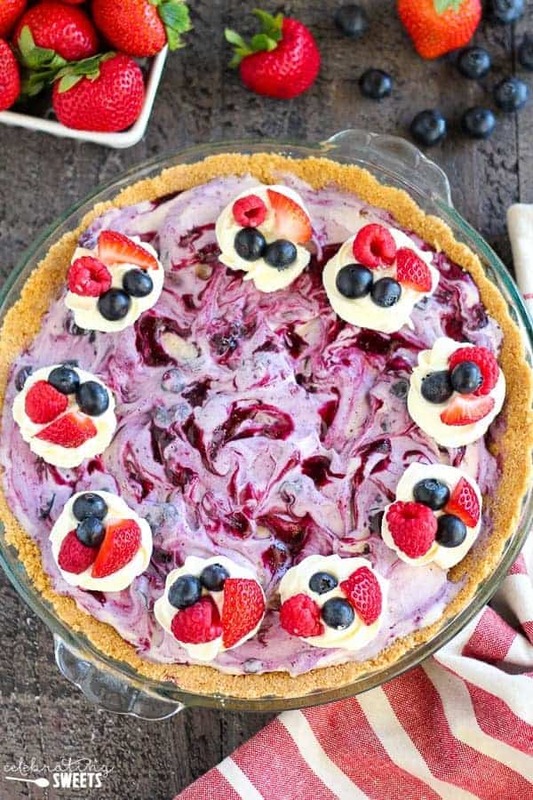 This year my husband requested a berry ice cream pie for his birthday. Last year I made him a Peanut Butter Fudge Ice Cream Pie and we all loved it, so I wanted to make sure this year’s pie was just as good. His requirements were berries, ice cream, and graham cracker crust. I decided to use a mix of homemade and store bought ingredients. There are a few different steps, but they are all easy. I start with a homemade graham cracker crust. 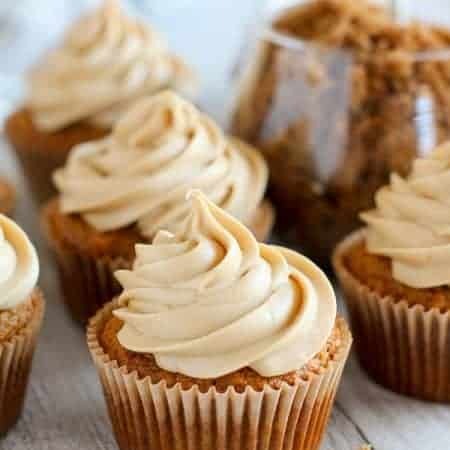 You can use a store bought graham cracker crust, but I think homemade tastes so much better. I fill the crust with store bought strawberry ice cream and then I swirl in homemade blueberry sauce. The pie gets frozen until firm, then right before serving I top the pie with whipped cream and fresh berries. 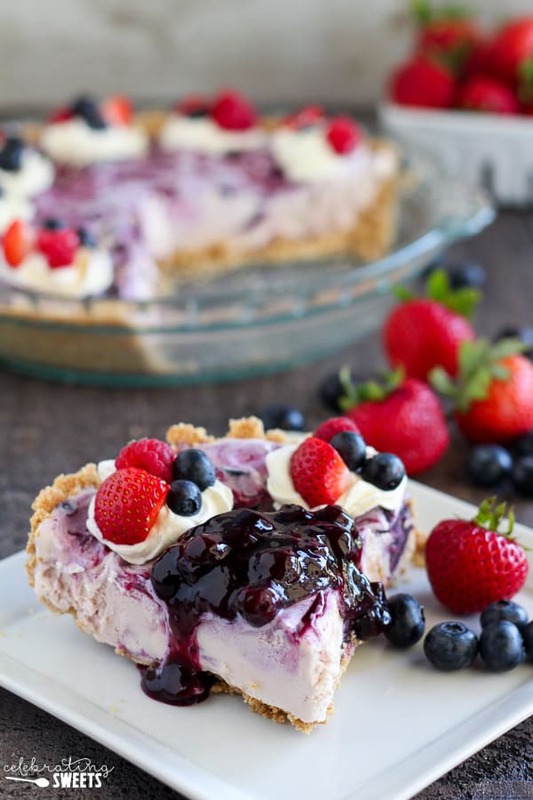 I top each slice with additional blueberry sauce for an added layer of berry flavor. Can we talk about this blueberry sauce? I freaking love it. Like, I could eat the whole batch of sauce with a spoon, straight from the pot, before it’s even cooled. That’s how much I looooove it. My family went crazy for this pie. My kids licked their plates clean (literally), and my husband not-so-sneakily devoured all the leftovers in the days following his birthday. When I pulled this pie from the freezer to serve it, my five year old, Jake, gasped “Oh mom, it’s beautiful!” ← true story, he’s seriously the sweetest. Summer will be over before we know it – let’s eat ice cream pie! 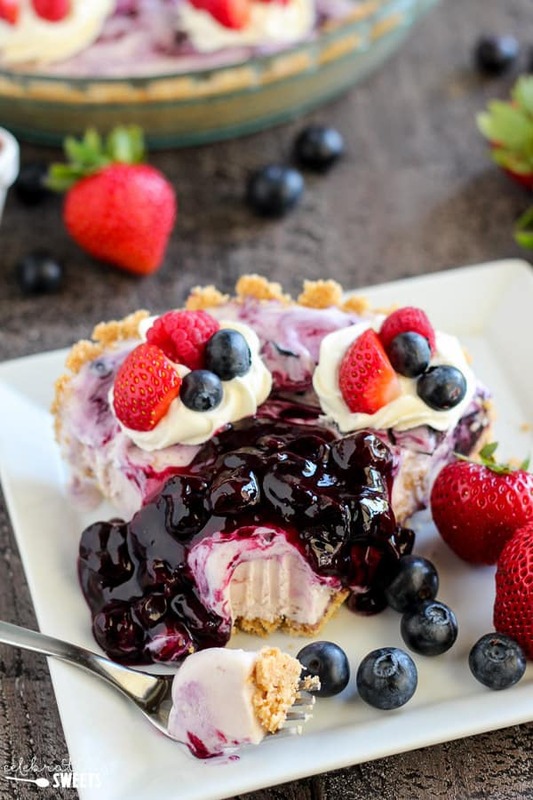 A graham cracker crust filled with strawberry ice cream, swirls of blueberry sauce, and a topping of whipped cream and fresh berries. A combination of homemade and store bought ingredients makes this a fun and easy summer dessert. Preheat oven to 325°F. In a large bowl, combine graham cracker crumbs and sugar. Add the melted butter and stir until combined. Dump the mixture into a 9½ inch pie plate. Press it into the bottom and a little more than halfway up the sides of the pie dish. I use the bottom of a drinking glass or measuring cup to help pack it in. Bake for 8-10 minutes, until golden and fragrant. Set aside to cool to room temperature, then transfer to the freezer for one hour. Meanwhile, prepare the blueberry sauce. in a small saucepan over medium heat, whisk orange juice, sugar, and cornstarch. Bring to a simmer, then add 1 pint blueberries minus 1/4 cup that's been set aside for the topping. Simmer, stirring frequently, until the mixture is thickened and some of the blueberries have burst, about 4 minutes. Stir in lemon juice. Transfer to a bowl and cool slightly, then refrigerate to cool completely. Remove crust from freezer and fill the crust with scoops of ice cream. Drizzle about half of the blueberry sauce around the ice cream and press the ice cream into a flat layer (you can also swirl some of the blueberry sauce into the top using a butter knife). Refrigerate the remaining blueberry sauce for topping the pie when it is served. Cover the pie and place in the freezer until frozen solid, preferably overnight. Allow the pie to sit at room temperature for at least 10 minutes to soften slightly. 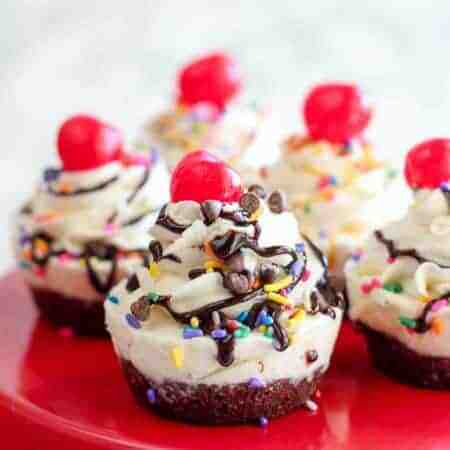 Meanwhile, whip heavy cream, sugar, and vanilla until soft peaks form. Pipe or dollop the whipped cream onto the pie and decorate with fresh berries (including the reserved 1/4 cup blueberries). Serve each slice with a little extra blueberry sauce. This looks absolutely heavenly! Definitely need to make this soon.